I was so sorry to hear a couple of weeks after the event that the poet Richard Wilbur had fallen asleep in death. It’s interesting to read about the ambivalence within the community of literary critics regarding his work throughout his career and now at his passing. Might it be that one’s opinion about Wilbur’s poetry has something to do with whether you appreciate his perspective on things? If when you read his poems you find they quicken your own love for life and the cosmos? In another quote from the New York Times: “’I feel that the universe is full of glorious energy,’ he said in an interview with The Paris Review, ‘that the energy tends to take pattern and shape, and that the ultimate character of things is comely and good. '” My favorite not-so-recent article on Wilbur draws attention to his Christian vision and is found in First Things. Over the life of my blog many of Wilbur’s poems have shown up here — which you might find by putting his name in the search box on the right — and I’ve been wanting to post his poem “Worlds” for a year or more now. I first read it when David Bentley Hart’s book The Experience of God was fresher in my mind, and I had some brilliant idea that linked the two philosophers… that thought has dimmed to the vanishing point. Now I offer the poem as a picture of two ways of looking at the world, represented by Alexander the Great and Isaac Newton. If Richard Wilbur imagined himself in this poem, I’m sure he would hope to be found serenely playing alongside Newton, another man of faith and great vision. May God grant him the Kingdom. did not contribute to his discontent. But Newton, who had grasped all space, was more serene. Of that profundity he had not made. To prepare for a recent road trip, I visited the public library looking for a book on CD. I ended up with a whole stack of boxes to take along in the car later that morning and was very pleased with a few of them. My car was also loaded down with a Thanksgiving turkey, baking pans and tablecloths and some already cooked food, things to contribute to a feast at Pippin’s house. I was taking myself early to help prepare, and Mr. Glad would follow later. Two slim library cases held one disk each of an introduction to a book in the Big Read program of the National Endowment for the Arts. I was only vaguely familiar with the list and the program, not having any family member that I know of participating. But of the offerings I browsed I was interested in A Wizard of Earthsea by Ursula K. LeGuin because of recent recommendations from someone, I can’t remember who. 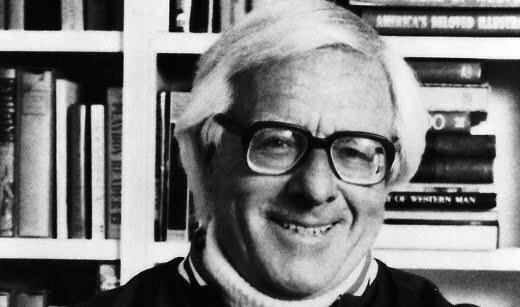 And Fahrenheit 451 by Ray Bradbury was a book my reading group discussed a decade or so ago. The recordings were about 30 minutes each. When I slid the Wizard introduction into the player and the narrator’s voice came into my car, it took me a few seconds to realize that it was Dana Gioia, my favorite book reviewer, poetry critic, and literature teacher. His voice was recognizable, but his intonation was all jazzed up, brighter and more dramatic, I suppose to keep the average somewhat reluctant American reader listening. His commentary was in brief snatches, and mostly introductory to several other authors who talked about the book, including LeGuin herself, and to short passages read from the text. None of the comments or readings was longer than a minute or so, and most were much briefer than that, which made it easy for me to pay attention; I’m sure this feature was also designed for listeners of diverse ages who are used to having their short attention spans catered to. The Big Read program is intended to reverse or at least slow the decline in the number of readers in our nation, and I haven’t heard if it is working. But this recording was a wonderful introduction to LeGuin. I enjoyed myself thoroughly while listening to what seemed like a sort of CliffsNotes in audio technicolor. There is music in the background that also adds to the drama. CliffsNotes (Yes, they do squish the name together like that nowadays) seems to have some videos out, and digital flashcards, but for literature I think these NEA audio files would be much preferable, being a better bridge to visual and private reading activity than listening to a talking head, as I assume the CliffsNotes videos are. The general plot and themes of the novel were discussed, and the particular skills of that writer. LeGuin talked about her background as a reader and writer and how she developed into the writer she is. Her childhood was spent in an intellectually rich household in Berkeley, where her father founded the anthropology department at the university and her mother wrote a book on Ishi. There were many refugees from Europe in town then, such that “everyone had an accent.” It seems that her exposure to many cultures nourished her imagination to create new worlds and people groups. 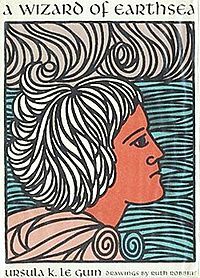 The Earthsea books do sound appealing to me now, and if I keep looking at that cover illustration I pasted here I’ll be bound to buy the first one soon. But the first CD I took out of the box from my library stash was not from the NEA; it was a 2-disk collection of Popular Poetry, Popular Verse, Volume II from Naxos AudioBooks, a broad offering of everything from Shakespeare and Longfellow to Donne and Robert Herrick. It’s not surprising that I didn’t remember hearing most of the poems before — but I’d like to listen again. The many love poems made me miss my husband whom I had only seen a couple of hours before. Out of the 5+ hours I was on the road on the way up the state, there were only 10 minutes or so that I didn’t need my windshield wipers. The rain was often drenching, so when I had to stop for refueling and resting I was back in the car lickety-split and pushing the Play button again. I tried a speech by author David McCullough, his Jefferson Lecture in the Humanities from 2003, but he was very dry, in content and delivery. I have found from Mars Hill Audio Journals that some writers of the most fascinating books are not good at speaking even in interviews. The last thing I was listening to when I arrived home again the day after Thanksgiving was Alexander the Great and His Time by Agnes Savill. It is nine CD’s and I only heard three of them, but it was the most detail I’ve ever read on Alexander, who is certainly a fascinating ancient man. The descriptions of battles sometimes were hard for me to follow, but overall it was an easy “read” and I’m trying to figure out when I might finish it. I kept thinking about the great contrast between my comfortable life — just sitting in my heated car snacking on food that I had easily bought at the store — and that of the high-achieving, fighting, indomitable but gracious man who slogged all over his world under the harshest conditions and must have had comparatively little ease in his relatively short life. And the other Big Read disk? That was my favorite of the two I tried, because I still remembered Fahrenheit 451. It was wonderful to hear the author tell how he and his brother would run, not walk, to the library, and spend hours there every week. He started writing stories as a young child, and never stopped. Here’s a list of books in the Big Read program. I’m planning to listen to more of the introductory recordings, which are lots of fun even if I never get around to reading the actual book.